Engineering is a science that can improve the quality of human life, but unless it is delivered in the right sense, it just remains to be a professional degree. Keystone School of Engineering (KSE), promoted by a group of engineers/academician is an educational group which has its focus on making the professional degrees worth valuable by helping in the betterment of society. "The aim of engineering courses at Keystone is to provide students with all the analytical, design and computing skills that underpin modern engineering practice. Along with it, the focus is also laid on encouraging the creativity and problem-solving skills that are so important to be a good engineer," says Bharat Bhushan Sud, Dean, Training and Placements, KSE. Currently, KSE offers four-year full-time under-graduate programs in three undergraduate departments, namely Mechanical Engineering, Electronics & Telecommunication Engineering and Computer Engineering. "We mould our students in such a way that they become true professionals. Our prime focus is laid on training students in soft skills so that they fulfil the basic requirement of a professional," claims Bharat Bhushan. Just after making a strong foundation in communication, students are trained in foreign languages like JAPANESE, CHINESE & GERMAN and industry related skills along with the strong technical training. Keystone Group's "Creativity and Leadership Project" is a multi-disciplinary effort designed to provide students with opportunities to put their innovative ideas into practice. "The students of professional courses are not under any stress in our institute. We are maintaining the record of studies weekly and if any difficulty arises, the concerned faculty attends to it. Also, we have a system where every mentor is made responsible for 20 students in the course duration," pinpoints Bharat. Professional engineers are primarily moulded by giving them opportunities in the areas concerned with innovation, creativity and change. Thus, their work requires original thought, discretion, and sound judgement. "We focus more on employing fresh strategies in teaching wherein all the staff members are supposed to make a presentation before they start teaching courses for any semester. It is presented in front of external experts who evaluate whether the mentors are fit to teach the subject and achieve the academic excellence required by students in the course," adds Bharat Bhushan. Keystone Group's 'Creativity and Leadership Project' is a multi-disciplinary effort designed to provide students with opportunities to put their innovative ideas into practice. Open to all students, the project helps to prepare students for the challenges of implementing their own business ideas. This platform is an open forum where concept-development funding, workshops, internships, and lectures by alumni and practitioners are held. "Our workshop series challenges students to develop their entrepreneurial skill set and apply their academic and co-curricular interests in new ways through structured workshops. These workshops teach them the concrete skills while creatively engaging participants and it also includes proposal writing, business plan development, public presentation, and so on," states Bharat Bhushan. The 'Entrepreneur in Making' is another intensive program designed by the institute to provide exceptionally creative and motivated Keystone students with a dynamic environment where they can explore and develop sound business ideas. The program supports students with a wide variety of ambitions, including starting a grassroots organization, offering a new product or service, launching a tour, commercializing a discovery, and so on thus providing the students with a complete motivation in the entrepreneurship field. At the Keystone campus, experts from the industry are invited every week to brief the students about the trends in the industry. "In the last few months, the students were able to get a lot of exposure with add-on knowledge regarding the industry trends with the classes of experts. We have started the practice of sending students to the multinational companies and we are also actively pursuing tie-ups with these organizations for the betterment of overall education," says Bharat Bhushan. 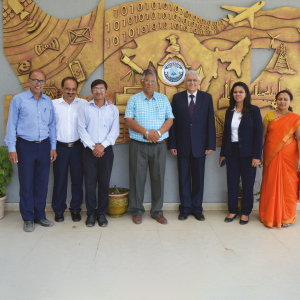 Keystone School of Engineering has established a world class engineering institute, leveraging the experience of its management team's successful past corporate experience in the US and India. The Management team is extremely passionate about grooming leaders who are not only the best professionals, but also good human beings with ethics. "We want to establish centres of excellence inside the campus in different areas and we have already taken a move on it by connecting with the companies like TCS, IBM and others for the same. Through the focus on entrepreneurship, innovation and research, we would like to create a bright future for the coming generations so that they bring about a positive change in the society," concludes Bharat Bhushan. He is graduated from reputed BITS PILANI in Mechanical Engineering. He has completed his MBA from FMS - University of Delhi. With vast experience of over 30 years with reputed national and multinational companies, he has worked in various managerial capacities. He has been instrumental in creating greenfield projects.